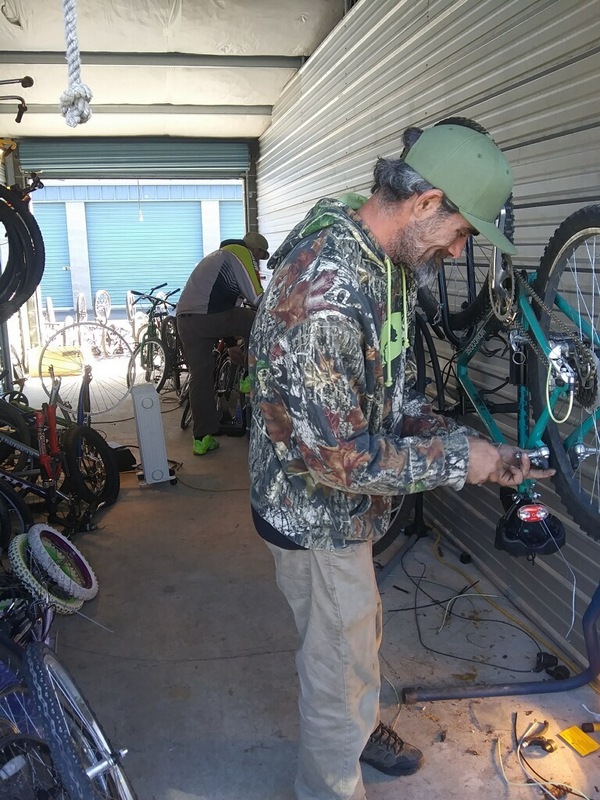 On any given weeknight, after pulling long hours working construction, Lonnie Boyer can be found tinkering in a rented storage unit, building bikes to give away for free. The Community Bike Giveaway Program his family began four months ago has exceeded their expectations and pushed their tiny shop to capacity, but it hasn’t stopped them from their vision to improve the lives of the most challenged, one pedal at a time. The family has built and donated nearly 200 bikes to rehabilitation programs, shelters and food pantries throughout Josephine and Jackson counties with more orders coming in. After researching other bike share and giveaway organizations the Boyers saw more growth potential if they attained non-profit status, enabling them down the road to work through the law enforcement and city of Grants Pass in possibly starting a city-wide bike share program. “It takes getting the money together to pay all of the filing and licensing fees. We’re renting a storage unit to work in, so funding-wise, it’s a little tough right now. We ended up with such an overload it got kind of scary for a minute,” he laughs. In the early ‘90’s, hitting the streets of Sacramento on their rebuilt bikes, the brothers would head to a local dump to climb the 30-foot heap of discarded bikes and dig down to its treasures at the bottom. Today, one of their favorite reclaiming centers is Cascade Recycling in Grants Pass where they can sometimes find up to 15 bicycles set aside for them. Boyer says he is amazed by the amount of community effort to donate and participate. Options for Southern Oregon, a private, non-profit mental health agency, was one of the first recipients for the free bikes. To find out more you can reach Lonnie Boyer at (541) 660-3456 or Micah Boyer at (747)264-7822.